Cheltenham festival is here. One of the biggest events in the racing calendar gets underway tomorrow (13 March) – even if you’re not a big racing fan, check out these words from days gone by to refer to horse racing. From Australian slang, this term is used to refer to a jockey’s whip. If a horse is described as catching pigeons, he’s said to be showing great promise on the training gallops. This term describes a horse that is unable to repeat his form on a racetrack. This term is Australian slang and dates back to 1915. It can be used to describe a racehorse lacking stamina. This word dates back to 1641 and simply means ‘at full gallop’. Remember that one next time you’re streaking down the bridleway at full pelt. With so much money involved with racing, it’s not surprising there are a few words for those who cheat. A bishop was someone who would disguise the age of a horse by tinkering with his teeth. Another word associated with cheating in horse racing, dropping anchor could be used to describe someone who causes a horse to run slowly in a race. Like this list? 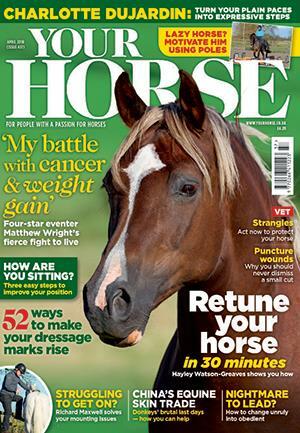 Then don't miss the latest issue of Your Horse Magazine where author Adam Jacot de Boinod picks out some intruiging examples of vocabulary from the equine world.